Have you ever made a New Year’s resolution for your pet that you had trouble keeping? Maybe this year you resolved to help your pet lose weight through healthy diet and exercise, but the winter weather has already made it difficult to get Fido in shape. Well don’t let cold weather be an excuse any longer – we have some tips and ideas to get Fido on the way to an ideal weight! Keeping pets at a healthy weight is so important. According to the Association for Pet Obesity Prevention, approximately 58% of cats and 54% of dogs in the U.S. are obese or overweight. Those percentages are worrisome, especially since we know obesity can increase the risk of additional health problems such as diabetes, heart and respiratory disease, osteoarthritis and cruciate ligament injuries, kidney disease, high blood pressure, and cancer. Obesity can even shorten life expectancies! So what can you do to keep your pet on course to a healthy weight when the weather is bad outside? If your pet is accustomed to one long walk, try shortening the walk and taking more walks in a day. This way your pet is not outside in the cold for extended periods of time. Play fetch inside with a soft toy, if you have a space that will allow for it. Use rooms or areas with non-slip surfaces such as carpeting. Try a laser pointer! Just be sure not to point the laser at the eyes. A game of gentle tug with your dog can be fun – just be sure to let him or her win some! Play games that encourage your dog or cat to hunt for a treat reward. For example, you could place food kibbles in several “hiding” places around a room and encourage your pet to explore to find them. Or, fill a Kong toy with some food and hide the Kong for your dog to find. Use puzzle toys. There are a variety of toys that require pets to work to get a treat reward. 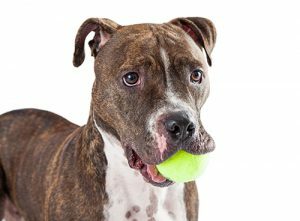 Often your pet will end up sliding the toy around the room (exercise!) as they try and get the treat. Have your pet try and catch a toy dangling from a stick. Play hide and seek with your pet. Homemade agility or obstacle courses can be set up inside, and they create lots of opportunities for exercise. Hold an indoor training session where you work on basic commands, including ‘Come’ and ‘Fetch’ (more exercise!). And remember – watch those calories! Everything adds up, especially during times when it may be more difficult for your pet to get a good amount of exercise. Make sure your pet is being fed an amount of food that is appropriate for his or her size. Keep treats and snacks to a minimum, and keep track of the calories in those treats. If it’s time for a diet, our staff can help you formulate a plan that will work best for you and your pet.